The assortment of power wirewound resistors includes Al housed wirewound resistors, cemented wirewound resistors and resistor assemblies with protection IP 20 and IP 54. The assortment is described in the following summary, detailed information are described in the PDF catalogues. Wire-wound power resistors (braking) TESLA in Al case are designed of the resistance spiral sealed into the ceramic tube using the insulating filler. Furthermore the ceramic tube is embedded into the Al case serving as a heat sink and a way of mounting. 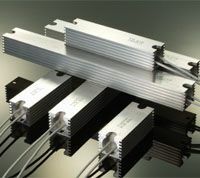 For high loads the resistor can be mounted on additional heat sink. For outlet are used cables with copper core. Sorted types are certified by UL. load at 25 °C: 10 W / 30 W - nominal load for ED=100% / nominal load with additional heat sink, ED – load factor = percentual ratio of switch-on time against cycle period up to 120 s.
load at 25 °C: 30 W / 100 W - nominal load for ED=100% / nominal load with additional heat sink, ED – load factor = percentual ratio of switch-on time against cycle period up to 120 s.
load at 25 °C: 45 W / 150 W - nominal load for ED=100% / nominal load with additional heat sink, ED – load factor = percentual ratio of switch-on time against cycle period up to 120 s.
load at 25 °C: 75 W / 150 W - nominal load for ED=100% / nominal load with additional heat sink, ED – load factor = percentual ratio of switch-on time against cycle period up to 120 s.
Wire-wound power resistors TESLA are made of the resistance spiral wound on ceramic tube and terminated by metal clips with connector. The resistor body is protected by high-temperature cement. The resistors are supplied with various holders. All resistor types can be eqquiped with setting cap (marked TRR). Protection IP 20: the resistors of TR 307, TR 308, TR 309, TR 310, TR 320 series (wirewound power resistors cemented) are fixed in cases from zinc plated steel sheet with terminal board and cable bushing. The case can be equipped with thermoswitch connected to the terminal board. Electrical connection is provided by clamp allowing to attach the wires up to 4 sqmm. 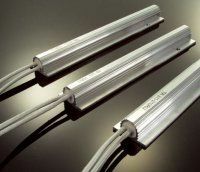 Protection IP 54: the set of Al housed power resistors (2 or 4 pcs of TR319, TR 355, TR 356 resistors) are mounted on stainless-steel base. Electrical connection is provided by a clamp allowing to attach the wires up to 4 sqmm. Used resistors are designed to meet the specific demands on pulse load capacity of the set - adiabatic impulse in kJ. Resistor assemblies with protection IP 20, IP 54 are manufactured as a custom products according to customer requirements. The assortment of film resistors includes high ohmic resistors. You can download electronic catalogs in Excel and PDF format. New summary of TESLA resistors, edition October 2018. Detailed data for wire-wound power resistors cemented, series TR 26x, TR 30x, TR 310, TR 320, resistors TR 409-TR 420 - oxidized wire and data for resistors assemblies. Detailed data for high-ohmic resistors. Detailed data for Al housed wire-wound power resistors (braking resistors), series TR31x, TR33x, TR 35x, TR 34x and for assemblies of resistors in Al case, protection IP 54 (IP 20). Do you need a PDF viewer? Download Adobe Acrobat.